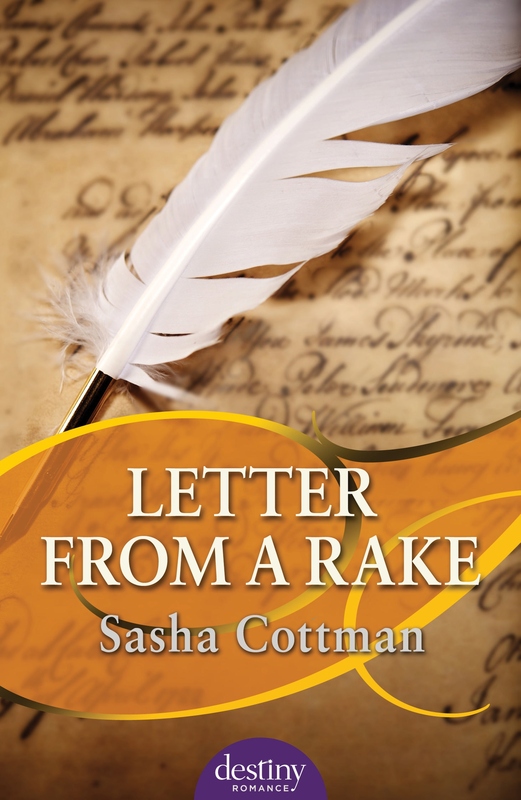 Today I’m talking with Sasha Cottman whose book, Letter from a Rake has just been released by Destiny Romance. Welcome Sasha! Thanks for the warm welcome Bernadette. You write Regency Historical romances. Can you describe your genre? What will readers find in a Regency Romance? Regency historical romances are set around the turn of the 18th century. The period only lasted 8 years while the future George IV reigned in his father’s place, due to the King’s mental illness. Most Regency novels loosely cover the period from 1800 to Victoria’s reign in 1837. Readers of Regency are often entertained with the story of dashing heroes and feisty heroines. The social and legal codes of the time restricted women’s lives greatly, but the modern Regency novel does tend to bend the rules, allowing the heroine to shine. The grandmother of all Regency novels, Pride and Prejudice is set around this era. Can you tell us about how your book Letter from a Rake came about? Letter from a Rake actually came about from a failed attempt at writing my first novel. In that book, Millie (the heroine of Letter from a Rake) was a secondary character, but she was so strong she basically shoved the poor heroine off the page and demanded I write her story instead. When you are continually dreaming about scenes involving a secondary character, it’s time to listen to your muse. The scene in the maze, kept me awake night after night until I finally gave in and started writing the full story. What I love about this story is the sense of family. My favourite Regency novels have always been ones where the characters have family around them; Julia Quinn’s Bridgerton series was one of the first Regency series I ever read and I fell in love with every one of her books. When you have family around your main characters, it gives you lots of scope to work with, as well as helping to establish backstories. When I am walking on the beach near our beach house, ideas often just pop into my head, as a result I have learned to carry a notebook on my walks. Walking at lunchtime is also a great way to solve plot problems. Do your characters appear first or do you have to go looking for them in the story? Characters always appear first. Usually the emotional state of a character will find its way into my thoughts and then the rest of the character gradually begins to form. What qualities do you see as most important in a romance hero? Humour has to be the most important thing to me. I need to like a romance hero and bond with him before I can then fall in love with him. Alex, the hero in Letter from a Rake has a lot of the humour of my four brothers. There are a number of scenes where he does things that my brothers have done in real life. I spent a long afternoon chuckling to myself as I wrote the hangover scene. What genre do you like to read and why? I’m an historical romance girl, I have read a few contemporary romances, but I always come back to the historical ones, especially Regency. I’ve read quite a few paranormal and fantasy fiction books along the way; I love the whole world building that goes with those genres. Once I discovered Tolkien at university, I became an unashamed Lord of the Rings fan. I visited the movie set in Wellington after I had gone to New Zealand on a business trip. If you own the extended directors cut of the Fellowship of the Ring DVD, you will find my name at the end along with the rest of the LOTR fan club members. Just one? Stephanie Laurens, especially her early Cynster novels. I think I own all her books. Special mention must go to Anna Campbell who runs a very close second, and is also a really lovely lady. I’ve picked her brains at several writers’ conferences. Do you have any words of wisdom for aspiring writers? Join a writers group; surround yourself with others who believe in their writing; it will help you to believe in yours. If you’re fortunate enough to join one of the romance writers groups somewhere in the world, make sure you volunteer some time to help the organisation. From judging and critiquing of other’s work, I’ve learned a great deal. I’m currently writing the next book in the Radley family series, which follows on from the epilogue in Letter from a Rake. Yet another secondary character who demanded his own story. The unconventional Miss Millie Ashton, recently arrived from India, finds England a cold and dismal place. The fashionable ladies of London society look down their noses at her and it isn’t long before Millie is planning her return to the country she considers home. When Millie befriends the high-spirited Lucy Radley, she also meets Lucy’s handsome brother, ‘Alex the Great’ and things take a turn for the better. Alex, the Marquess of Brooke, is considered the most eligible bachelor in London, yet he appears fascinated by the independent Millie. Letter from a Rake is available as an ebook from Destiny Romance, Amazon, Kobo, iTunes and Angus and Robertson. Sasha Cottman is in the virtual world. Blog www.sashacottman.com/blog The misadventures of an author in the Regency Kitchen. Lovely interview, Bernadette and Sasha. It’s great learning more about your stories and how you find inspiration! I’m the same, on my walks to the Byron Lighthouse I often solve plot issues. Yes, Jennifer! Just came back from a walk and have four new scenes to write now! FOUR scenes, Bernadette? How far did you walk? Long walks are the secret of all writers, so many plot problems get sorted while pounding the pavement. Now I can’t wait to begin reading your book, Sasha! You know, I think one of the primary markers of a good Regency romance is the humour you mention. Jane Austen had it, and so did Georgette Heyer. These dashing heroes can’t take themselves (or be taken) too seriously! Even Mr Darcy needs to learn to be laughed at. Thanks Venetia, I love a good chuckle when I’m reading. I think it helps you to bond with the character and quietly stand on the sidelines hoping for them to get a happy ending. Thanks Venetia so many of the great scenes from pride and prejudice are the ones where humor was allowed to shine. Great interview Bernadette and Sasha! I’m reading your book at the moment Sasha and really enjoying it. Millie is refreshing, Alex is dashing and dishy and I love the witty dialogue…just lovely! Thanks Jennifer, glad you stopped by! Thanks Jennifer, I’m really pleased to see you are enjoying Alex and Millie’s story. Another wonderful interview, Bernadette, and lovely to find out more about Sasha. Love the idea of a heroine who’s just returned from India so I’ll add another to my TBR pile! Thanks Helene, I love your books. I hope you enjoy letter from a rake. Thanks for dropping by Maryde! Thanks Maryde, My poor abandoned heroine will eventually get her story told she is just sitting quietly in the drawer until she is ready. Thanks Allison I had a great time writing the hangover scene. Not so fond memories of university days. Great interview. Sasha – 4 brothers – no wonder you can write a witty and humorous hero! Congrats on your book – and look forward to reading it soon. Thanks for dropping by, Bernadette’s blog is a very busy place lots of great visitors. Brothers are the best source of finding ways to torture heroes. Thanks to all our commenters for taking time out of their busy lives to catch up with Sasha and myself. Wonderful support, ladies. Good luck with the release Sasha. Can’t wait to read it!